They claim the Mercedes S-Class is one of the world’s most technologically advanced cars. You can, if prepared to spend a bit, get it to do all sorts as it becomes more and more a car that can ‘drive’ and ‘think for itself’. The other good thing about it is that so much of the technology it premieres quickly filters through to the other Mercedes models. The E-Class is a prime example of that with its ‘self-driving’ technology – something I’ve had the good fortune to sample here in Ireland a number of times. I’m a fan of the E-Class, as you know, but I feel the S-Class, for all its admirable, cutting-edge technologies, still has a few moulds to break on practicality – especially interior space. Obviously this newly face-lifted version was never going to address that deficit (even though the car is marginally, 9mm, longer). It was something my two rear-seat passengers complained about regularly on a memorable day trip to the midlands and back. The boot isn’t madly copious either, but I didn’t tell them. I had other criticisms. For such a sophisticated car, it would be helpful to have fewer buttons to contend with. More importantly, I found the illustrations/graphics denoting those buttons’ functions to be poor – especially in any sort of sunlight. I don’t think it’s a good idea to have delicate little iconography etched onto near-similar coloured silver buttons. They need much greater contrast to be instantly recognisable – and I suggest they need to be more tactile. Ah, said my passengers, you’d soon get used to them. Well I spent a lot of time driving this and I still wasn’t happy. The voice control system also wasn’t great. It kept giving me the same list of people to call on the hands-free when I clearly specified my intended recipient. Probably my fault, but it shouldn’t be a gripe at all. Am I being a bit cheap/harsh here criticising apparent peripherals? Maybe. But if you can’t highlight such grievances on a €108,818 (test car) S-Class Merc, where can you? They are not peripherals. These are everyday usage items and have to be spot on. Just like Mercedes to be brilliantly on-the-button (please forgive unintended pun) with the front nappa leather seats. They were wonderful. I could drive all day (nearly did) in them and not feel stiff or weary. Now that’s absolutely what a top Merc should be all about. 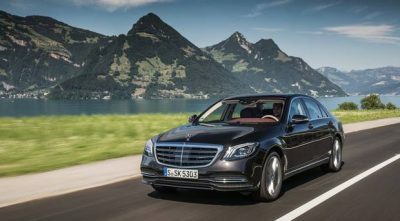 It just so happens that the S-Class revision comes at a time of a ferocious drive by the distributors here to gain market share across all segments. Prices have been cut, equipment added for little extra, and they’ve accused others/rivals of using new-car registration ploys rather than ‘pure’ sales to boost and hold positions in the top sellers’ league. It’s hot and heavy out there right now, believe me. So what have they done to the S-Class? Outside, not a lot really, though the AMG bodystyling was effective. The front gets a bit of work; the radiator trim with three twin louvres and vertical bars in high-gloss black that was previously only on the S600 V12 is now standard. There’s a new lower bumper, larger air intakes and integral rear-bumper tailpipe trim. New LED tail lights and 18in 5-twin-spoke light-alloys are standard. And so on. Inside, there’s the new 3-spoke steering wheel, ambient lighting with 64 colours, keyless go system and wireless charging for mobile phones (brilliant). The latest reversing camera has higher resolution while the combination of touchpad with controller is now standard. And the new multibeam LED lights have ultra-range highbeam (the automatically dim when they detect oncoming traffic). But I’ve left the best until last. My S350d AMG Line had as good an engine under a three-pointed-star bonnet as I’ve driven for a long time. The newly developed 2,925cc 6-cyl in-line pumps 286bhp (and 600Nm of torque/pulling power). With a seamless nine-speed automatic gearbox, here was the true heartbeat of a ‘top people’s car’. It was also surprisingly agile for such a large motor. I thought the humpty-dumpty Woodfield Bog road would catch it out. Not a bit of it. This swept remarkably easily at speed over what would be sump-scouring protrusions and plunges for many a vehicle. Of course, it is mainly a car for the open road and it seriously impressed with its silent and swift ease of passage. That 6cyl engine, by the way, manages a standing start to 100kmh in just six seconds – prodigious acceleration for a car of this stature. A claimed 7pc reduction in fuel consumption has them saying you’ll get 5.1-5.4-litres/100km. And at 139g/km, road tax is €280. I have my cribs about it, but as a driving package – or as one to be driven in – I came away from the S-Class far more impressed than I’d expected. Rivals such as the BMW 7 Series rightly command praise for driving agility and technology. But with Mercedes pushing hard with cars like this S-Class, things just got a whole lot hotter out there.